Prime Location!!! 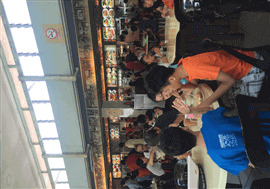 Food Stall In Air Con Food Court In CBD Area!!! Food Stall Available in Raffles Place. Air Con Food Court!!! Existing Equipment can be taken over!!! Rental: $6500 or GTO Very Strong Lunch Crowd!!! Able to Sell Noodle Cuisine!!! Please contact 88110901 for More info. Changi Airport Terminal 2 Staff Canteen Food Court Stall For Immediate Takeover !!!! Changi Airport Terminal 2 Staff Canteen Food Court For IMMEDIATE TAKEOVER . Halal License . No takeover fee ! Interested parties only ! Hi i am looking for stall to rent. Preferably in sengkang, or north side / east side located in those small centrals area. With good crowd preferred. Budget up to $3.5k. Selling laksa and handmade mee hoon kueh.